by Dr. Christopher Chang, last modified on 4/2/19. Tonsillectomy and adenoidectomy (T&A) is one of the most common procedures performed in the United States today. Despite its common status, many patients are unaware of where the tonsils and adenoids are actually located let alone when it is appropriate to have them removed. This article is to help answer these and other questions. If you are looking for information regarding peritonsillar abscess evaluation and treatment, click here instead. The tonsils are located in the back of the mouth flanking the uvula (the little dangling thing at the back) along the sides of the throat. The adenoids are located above and behind the uvula and can only be seen on endoscopy. The tonsils and adenoids are basically lymph nodes just like in your neck, but rather than being hidden under the skin, they are on the surface of your throat where you can see them. As such, removal of the tonsils and adenoids have minimal (if any), impact on a patient's immune system as there are hundreds of other lymph nodes that can pick up the slack. 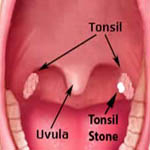 More info here regarding tonsil removal's affect on the immune system. The tonsils and adenoids generally regress in size with age to the point they can be quite small in adults. However, it is not unusual for children to have enormous tonsils the size of walnuts and even ping pong balls. Adenoids may be similarly enlarged. 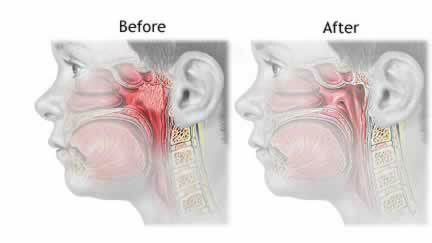 Just because tonsils and/or adenoids are enlarged is NOT a good enough reason for surgical removal. T&A is recommended ONLY when they are actually causing a functional problem. What are some of these functional problems? Sometimes the tonsils can be so large that a patient may have trouble swallowing and even affecting taste such that eating becomes a chore. Not only that, they may impact sleep as there is not much room for air to pass resulting in obstructive sleep apnea which is a serious medical condition. Obstructive sleep apnea can be diagnosed by a sleep study test. However, for children older than 3 years old, a sleep study is not required if there is a good clinical history suggestive of sleep apnea,. For those under 2 years old, a sleep study must document obstructive sleep apnea prior to surgical consideration. When the adenoids are large, they may lead to problems breathing through the nose leading to persistent mouth-breathing and hyponasal speech. Such a situation not only causes a dry mouth, but bad breath and even occlusal problems which can cause adverse facial structural changes (adenoid facies). Large adenoids also cause symptoms very similar to recurrent sinus infections, allergies, and the persistent snotty nose. Removal of the adenoids often resolves all these symptoms which previously were erroneously attributed to such chronic sino-nasal infections and/or allergies. A trial of nasonex may be helpful to address isolated large adenoids prior to surgical removal (read the research here and Cochrane review here). 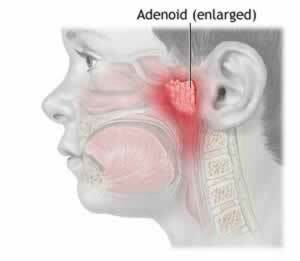 Read more about adenoids here. Picture taken from National Library of Medicine. Persistent infections and tonsil stones (tonsilloliths) are reasons to remove the tonsils and adenoids (tonsils only for tonsilloliths). A minimally invasive procedure called cryptolysis can be done for tonsil stones rather than tonsillectomy. Fever of 101 degrees F (38.3 degrees C) or higher. Enlarged or tender lymph nodes in the neck. A pus-like coating, known as exudate, covering the tonsils or the surrounding throat area. Evidence that the infection is streptococcal in origin. These are just "guidelines" and depending on the particular history of any given patient, the guidelines may be relaxed. For example, if a child has had two episodes of tonsillitis that were so severe, hospitalization was required for several days each time, that may be enough of a reason to have the tonsils and adenoids removed. Suffering from a peri-tonsillar abscess is another reason one may decide to relax the criteria (usually having 2 in one year is suficient justification). Social reasons may also play a role such as when a given child has already missed 6 weeks of school due to several tonsillitis but doesn't meet the guidelines strictly. Who decides on whether surgery is to be performed if guidelines are not set in stone? In the end, it is up to the patient (and/or guardians) after discussing with their primary physician and ENT. Often, the tonsils and adenoids don't get infected per se, but are still irritated enough to the point that they just stink. Often they produce white stones called tonsiliths which also taste terrible. When conservative measures do not help, removal of the tonsils and adenoids are justified. Here is more information on bad breath. Unfortunately, tonsil cancer is a common location for malignancy. In children, lymphoma is the main concern and in adults, squamous cell carcinoma is common, especially in those who smoke and drink alcohol. Cancer is of concern when one tonsil is particularly sore and/or larger than the other side. Read more info here. Great! So how are tonsils and adenods removed? When it comes to tonsillectomy, there are two different flavors. One is a complete tonsil removal and the other is a partial tonsillectomy where the rim or capsule of the tonsil is left behind (intracapsular tonsillectomy). Why would a partial tonsillectomy be performed? It's because the pain of recovery is substantially reduced... the downside is that there is a much higher chance that the tonsils will grow back. 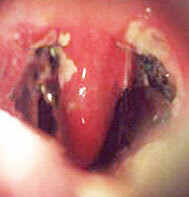 Typically, only in young children (<3 years old) is intracapsular tonsillectomy performed. Regardless of the type of tonsillectomy, in our practice tonsils are removed by an innovative procedure called coblation that both cuts and stops bleeding simultaneously. The device uses a plasma field which literally breaks the molecular bonds that hold tissues together without releasing excessive heat resulting in minimal injury to surrounding tissues. The surgical procedure itself takes less than 15 minutes to perform generally speaking. With the addition of anesthesia, the whole procedure takes about 30-45 minutes from falling asleep to waking back up. Watch a video here of a tonsillectomy being performed and is illustrated on the right. 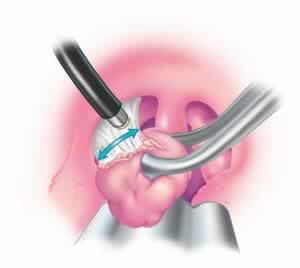 Other less-utilized methods of tonsil removal include electro-cautery, CO2 laser, harmonic scalpel, scalpel, etc. Sutures are rarely placed given they have been found to increase pain afterwards and has no effect on bleeding complications (reference). After tonsillectomy, the appearance may be quite alarming, so here are a few pictures of what NORMAL looks like after the surgery. The uvula can be 2-4X bigger than normal. Also there is a NORMAL white discolored eschar on the sides where the tonsils used to be. This is scabbing (which turns white when wet). This appearance will slowly improve over a few WEEKS. On a day-by-day basis, the appearance does not change too dramatically. The adenoids are removed by several different methods depending on the surgeon and may involve use of electro-cautery ablation or curette. Watch a video here of an adenoidectomy being performed by suction cauterization. Coblation may also be used in some situations as depicted in the illustration to the right. Keep in mind that adenoidectomy performed in very young children (<4 years old) have a higher risk that the adenoids will grow back later in life (5-10%). Keep in mind that another factor to take into consideration prior to recommending surgery is age... If a child is less than 3 years old, there is a 10-30% complication rate (references #1, #2 and #3) from airway compromise with a tonsillectomy in the post-op period, especially for kids with obstructive sleep apnea (if surgery done for infectious reasons, the risk is lower). As such, PICU monitoring after surgery is often recommended. This risk significantly decreases by the age of 5 years. Read more about overall tonsillectomy complications in children under 3 years of age here. There are storybooks for kids to help prepare them for surgery. With traditional complete tonsillectomy, kids (<12 years of age) usually recover within 7-10 days and sometimes as early as 2 days. Adults (12+ years), unfortunately take a much longer time to recover. Adults can expect to suffer from a terrible sore throat for a minimum of 2 weeks before the pain starts to get better at the 3rd week. It is not unsual for an adult to lose on average 10 pounds as it is too painful to eat food. Complete recovery for an adult may take as long as 4-6 weeks, though most adults are able to resume normal diet and activity by the end of the 3rd week. Indeed, the most common complication after this surgery is dehydration requiring IV fluids to correct. Significant abnormal bleeding after tonsillectomy only rarely occurs, but requires immediate medical attention. With intracapsular tonsillectomy, the pain of recovery is shorter and less painful, though still present. If adenoidectomy is performed WITHOUT tonsillectomy, the pain of recovery is also much less. Occasionally, there may be some slight taste alteration which will also normalize over time. 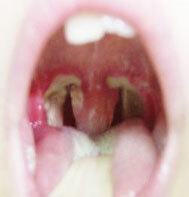 If the tonsils and adenoids were extremely large, the speech/voice quality WILL change, potentially quite signficantly. 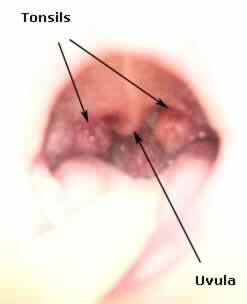 This voice change is permanent as it is a physical change of the space where the tonsils and adenoids used to be. The best way to explain this change is an analogy... Imagine talking inside a cramped closet versus talking in a large auditorium. Although it is still you talking, the space into which you are talking has changed causing you to sound different. Same goes for this surgery... after surgery, the voice is talking into a large auditorium instead of a cramped closet. Regardless whether it is a child or adult, the diet during the recovery phase is mainly a liquid diet (if you have to chew it, don't eat it). More information on post-op recovery period. If the patient is a child, below are some safe videos you can watch with your child to prepare them for day of surgery! What is the Best Antibiotic for Strep Throat? Tonsillectomy "May" Help with PANDAS?